Slavutych (Ukrainian: Славу́тич) is a city in northern Ukraine, purposely built for the evacuated personnel of the Chernobyl Nuclear Power Plant after the 1986 disaster that occurred near the city of Pripyat. 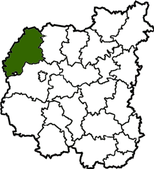 Geographically located within the Ripky Raion, Chernihiv Oblast, Slavutych is administratively subordinated to the Kiev Oblast as a town of oblast significance. As of 2014, the city has a population of 25,112 inhabitants. 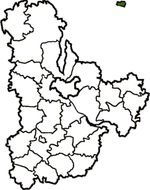 Ripky Raion within Chernihiv Oblast. The non-shaded white dot at the southern edge indicates the city of Slavutych. Slavutych is situated on the left bank of the Dnieper River, 40 kilometers from Chernihiv, 45 kilometers from the city of Pripyat, 50 kilometers from Chernobyl (both in Ivankiv Raion) and 200 kilometers from Kiev. While being geographically located in Ripky Raion (part of Chernihiv Oblast), administratively it belongs to Kiev Oblast. It is an administrative exclave, not belonging to any raion. The city was built in 1986 shortly after the Chernobyl nuclear disaster, to provide homes for those who had worked at the Chernobyl nuclear power plant and their families. They were evacuated from the abandoned city of Pripyat. Slavutych is named after the Old Slavic name of the nearby Dnipro River. The economic and social situation of the city is still heavily influenced by the power plant and other Chernobyl zone installations. Many of the residents still work in the energy industry in the region. 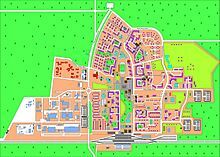 In an interview with Pravda published on October 10, 1986, Erik Pozdyshev, the newly appointed Director of the Chernobyl nuclear power plant, officially announced that a new city was to be built. Construction of the town started shortly thereafter, and the first inhabitants settled in October 1988. The city was intended to replace Pripyat which became a ghost town after it was evacuated thirty-six hours after the nuclear disaster due to the nuclear fallout. There is a memorial in Slavutych to remember the victims of the disaster, especially to those who lost their lives immediately after the event from radiation-related diseases. The city is mostly home to survivors of the disaster who had to be relocated from the evacuation zone around the reactor, among them about 8,000 people who were children when the disaster occurred. As a result, the number of people who have a radiation-related illness is high. [dubious – discuss][quantify] Many inhabitants still work at the site of the former plant for monitoring, maintenance or scientific purposes. They commute to the zone on a regular basis. 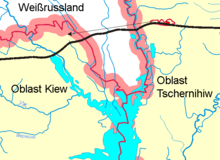 A rail line (twice crossing the international border with Belarus) runs directly from the city to the site of the plant. Slavutych is located about 50 kilometers east of the former plant. The site had to be a reasonable distance away from the Chernobyl zone to ensure the risk of radiation-related illnesses was reduced. However, other factors that contributed to the choosing of the site were the availability of a nearby ready railroad infrastructure, and an accessible water supply from the nearby Dnieper River. In order to build the city, the ground was covered with a two-meter layer of uncontaminated soil. From the start, Slavutych was planned to become a "21st-century city". Compared to other cities in Ukraine, Slavutych has a modern architecture with pleasant surroundings, and the standard of living in the city is much higher than in most other Ukrainian cities. During the construction of the city, workers and architects from eight former soviet republics became involved: Armenian SSR, Azerbaijan SSR, Estonian SSR, Georgian SSR, Latvian SSR, Lithuanian SSR, Russian SFSR and Ukrainian SSR. As a result, the city is divided into eight districts named after the capitals of the contributing republics, each with its own unique style and atmosphere. In addition, the city has a youth center, a modern community center, a town hall, an Internet cafe, numerous sports facilities, modern clinics, and a hotel. Around 80% of housing in the city is formed by apartments while the other 20% is formed by small, family houses. The city has a uniquely high birth rate as well as surprisingly low mortality. As a result, the average age in Slavutych is by far the lowest of any city in Ukraine. More than one third of its inhabitants are under 18. The infrastructure and public facilities of the city are mostly paid by the company which operated the Chernobyl nuclear plant. Because the remaining units of the nuclear power plant were shut down in 2001, the city would face significant social problems and an uncertain future. Until 2001, approximately 9,000 people worked at the plant. Since the shutdown, this number has dropped to 3,000, most of them working on monitoring and maintenance. 85% of the city budget was funded by the operator of the plant. In order to support the settlement and establishment of new companies, Slavutych was declared a Special Economic Zone. In addition, substantial vocational retraining programs are provided by the government to improve the occupational outlook of those who lost jobs. Despite these efforts, about 1,500 people have already left the city, a trend which is predicted to continue for the foreseeable future. 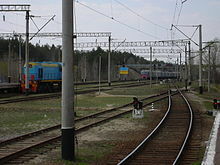 Slavutych has a railway station, and a minor stop in the locality of Poselok Lesnoi, on the Chernihiv–Ovruch line. It is served by a branch (Semenyahivka-Slavutych) of the regional highway P56 Chernihiv-Chernobyl, and by the provincial road T2506. ^ Чисельність населення на 1 березня 2014 року та середня за січень-лютий 2014 року. oblstat.kiev.ukrstat.gov.ua (in Ukrainian). Retrieved 3 May 2014. ^ "Cafebabel: A second life for the inhabitants of Chernobyl". Retrieved 2010-02-27. Wikimedia Commons has media related to Slavutych. This page was last edited on 11 March 2019, at 22:39 (UTC).